ভাগবত পুরাণ , ভগবদ্গীতা, মহাভারত"
↑ Harle, J. C. (১৯৯৪)। The art and architecture of the Indian Subcontinent। New Haven, Conn: Yale University Press। পৃষ্ঠা 410। আইএসবিএন 0-300-06217-6। figure 327. 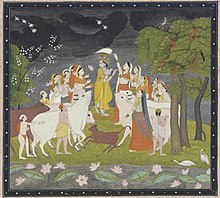 Manaku, Radha‭'‭s messenger describing Krishna standing with the cow-girls, from Basohli. ↑ Sunil Kumar Bhattacharya Krishna-cult in Indian Art. 1996 M.D. Publications Pvt. Ltd. আইএসবিএন ৮১-৭৫৩৩-০০১-৫ p.128: Satha-patha-brahmana and Aitareya-Aranyaka with reference to first chapter. ↑ Sunil Kumar Bhattacharya Krishna-cult in Indian Art. 1996 M.D. Publications Pvt. Ltd. আইএসবিএন ৮১-৭৫৩৩-০০১-৫ p.126: "According to (D.R.Bhadarkar), the word Krishna referred to in the expression 'Krishna-drapsah' in the Rig- Veda, denotes the very same Krishna". ↑ Tripurari, Swami, Gopastami, Sanga ওয়েব্যাক মেশিনে আর্কাইভকৃত ১০ ডিসেম্বর ২০০৯ তারিখে, 1999. History of Indian Theatre By M. L. Varadpande. Chapter Theatre of Krishna, pp. 231–94. Published 1991, Abhinav Publications, আইএসবিএন ৮১-৭০১৭-২৭৮-০.